In the past we have paid tribute to the brave men and women who fight valiantly to preserve our freedom. 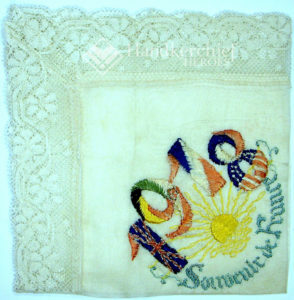 Today, we’ve compiled those tributes into a YouTube video to showcases handkerchiefs from WWI and WWII. The musical accompaniment is “Hymn to the Fallen” sung by the Mormon Tabernacle Choir. As you view the video, you’ll notice souvenir handkerchiefs American soldiers brought back from Europe are intricately embroidered. In this sample, the flags of many nations are depicted in the numerals 1918. 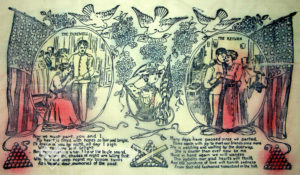 Conversely the handkerchiefs created stateside contain images ink stamped on silk. 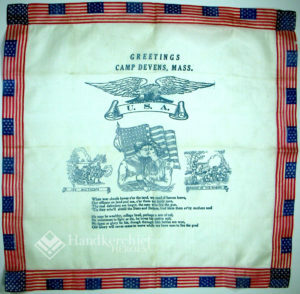 They were often purchased at training camps for soldiers to send to their sweethearts. They were mass produced in haste, as men were literally marching off to war. 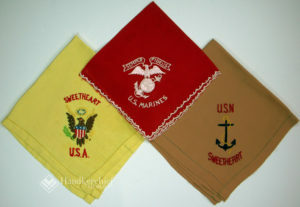 In stark contrast to the silk hankies are the nylon souvenirs of WWII. Why nylon? Silk was rationed, as it was in high demand for parachutes. 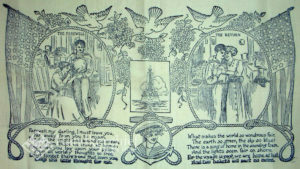 Handkerchiefs contain a wealth of history if one takes the time to look. 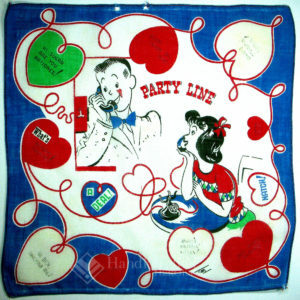 Something as simple as the phrase “Hey Sugar, are you rationed?” found in this next well worn (translation: well loved) hankie would mean nothing to today’s teen, but for those who lived through WWII, they understood all too well sugar was rationed (from 1942-47), along with coffee, milk, cheese, meat, tires, cars, bicycles, gasoline, kerosene, fuel oil, typewriters, rubber and more. So do enjoy our You Tube tribute to the talented, terrific, tenacious men and women who serve our country. “You can have peace or you can have freedom. Don’t ever count on having them both at once. I always love your blogs. Thanks. I would like to be able to share the Memorial one on Facebook. Is that possible? Certainly. I would be honored. You offer one stunning, beautifully written blog after another. Such a joy to read them. What a sense of history and beauty you reveal. Thank you so much for your work, and providing such reading pleasure. Can’t find where to start the Youtube video. just click on the words WWI & WWII Video or Lipstick Video. They are already linked to you tube.